1. A complete flint worked flake of Neolithic date (4000-2350 BC). The lithic is sub-rectangular in profile and is concavo-convex in section. The dorsal surface contains three predominant negative scars with corresponding arrises. The proximal dorsal surface retains some cortex. All edges contain semi-abrupt retouch. The ventral surface is smooth a with a small bulb of percussion situated at the distal end and ripples of percussion emanating from it. Some minor negative scars are evident over the bulb of percussion. 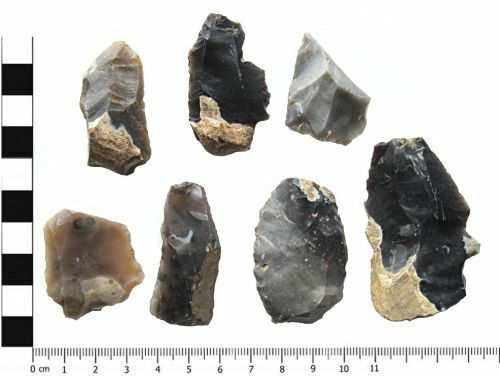 The lithic retains a minor amount of cortex and is therefore a secondary flake. Length: 43.00mm, Width: 22.00mm, Thickness: 12.00mm. Weight: 9.29g. 2. A complete flint worked flake of Neolithic date (4000-2350 BC). The lithic is sub-rectangular in profile and is plano-concave in section. The dorsal surface contains three predominant negative scars with corresponding arrises. The proximal dorsal surface retains some cortex. The proximal and distal edges have been abruptly blunted, the left and right hand edges contain rough semi-abrupt retouch. The ventral surface is smooth and slightly concave a with a small bulb of percussion situated at the distal end and ripples of percussion emanating from it. Some minor negative scars are evident over the bulb of percussion. The lithic retains a minor amount of cortex and is therefore a secondary flake. Length: 56.00mm, Width: 36.00mm, Thickness: 12.00mm. Weight: 22.54g. 3. A complete flint worked flake of Neolithic date (4000-2350 BC). The lithic is sub-triangular in profile and is plano-convex in section. The dorsal surface contains five predominant negative scars with corresponding arrises and is steeply convex. All edges contain rough semi-abrupt retouch. The ventral surface is smooth a with a small bulb of percussion situated at the proximal end and ripples of percussion emanating from it. Some minor negative scars are evident over the bulb of percussion. The lithic retains no cortex and is therefore a tertiary flake. The flint is grey in colour with cream inclusions throughout. Length: 38.00mm, Width: 29.00mm, Thickness: 29.00mm. Weight: 14.00g. 4. A complete flint worked flake of Neolithic date (4000-2350 BC). The lithic is sub-rectangular in profile and is plano-concave in section. The dorsal surface contains three predominant negative scars with corresponding arrises. The proximal and distal edges have been abruptly blunted and the distal, left and right hand edges contain rough, semi-abrupt retouch. The ventral surface is smooth and slightly concave with ripples of percussion emanating from the proximal end. Some minor negative scars are evident on the left and right hand edges of the ventral surface as a result of retouch. The lithic retains no cortex and is therefore a tertiary flake. The flint isa light brown in colour with cream and grey inclusions throughout. Length: 36.23mm, Width: 32.27mm, Thickness: 5.8mm. Weight: 7.8g. 5. A complete flint worked flake of Neolithic date (4000-2350 BC). The lithic is sub-rectangular in profile and is concavo-convex in section. The dorsal surface contains two predominant negative scars with corresponding arrises. The proximal right habnd edge retains some cortex. The proximal and distal ends have been abruptly blunted and the left and right hand edges contain semi-abrupt retouch. The ventral surface is smooth a with a small bulb of percussion situated at the distal end and ripples of percussion emanating from it. Some minor negative scars are evident over the bulb of percussion and along both the left and right hand edges as a result of retouch. The lithic retains a minor amount of cortex and is therefore a secondary flake. Length: 44.75mm, Width: 26.43mm, Thickness: 7.52mm. Weight: 7.3g. 6. A complete flint worked flake of Neolithic date (4000-2350 BC). The lithic is sub-ovate in profile and is plano-concave in section. The dorsal surface contains two predominant negative scars with corresponding arrises. The proximal distal dorsal surface retains a minor amount of cortex. THe proximal and distal ends have been abruptly blunted and the left and right hand sides contain semi-abrupt retouch and short scaled flaking. The ventral surface is smooth a with a small bulb of percussion situated at the distal end and ripples of percussion emanating from it. There is a single minor negative scar situated along the mesial portion of the left hand edge, likely due to retouch. The lithic retains a minor amount of cortex and is therefore a secondary flake. Length: 46.00mm, Width: 31.00mm, Thickness: 10.00mm. Weight: 16.4g. 7. A complete flint worked flake of Neolithic date (4000-2350 BC). The lithic is sub-triangular in profile and is concavo-convex in section. The dorsal surface contains three predominant negative scars with corresponding arrises. The proximal dorsal surface retains some cortex. The proximal and distal ends have been abruptly blunted and both the left and right hand edges contain low angle retouch. The ventral surface is smooth a with a small bulb of percussion situated at the distsal end and ripples of percussion emanating from it. A single negative scar is evident over the bulb of percussion. 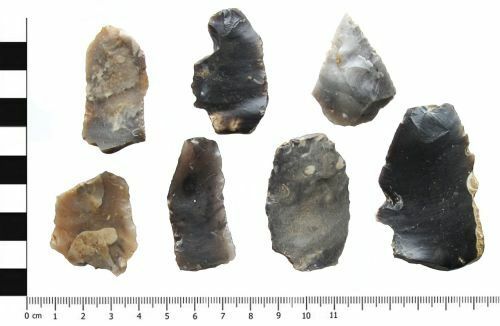 The lithic retains a minor amount of cortex and is therefore a secondary flake. The flint is dark grey in colour with cream inclusions throughout. The Cortex is light brown. Length: 45.00mm, Width: 21.00mm, Thickness: 9.00mm. Weight: 8.39g.